How to Update BMW ICOM Next firmware ? BMW ICOM Next A+B+C diagnostic and programming tool is the Latest Generation of ICOM A2 For BMW, MINI, Rolls-Royce BMW-Model. BMW ICOM NEXT newest firmware 3.14.10 is available. There are still many users confuse about how to update ICOM NEXT A+B+C firmware. There are two optional ways for you: one is using ISTA-D, another is by MSI Installer and Web interface. How to get to the ISTA connection manager? Then, upgrade the ICOM firmware by web interface. Note: For BMW ICOM NEXT firmware, the tarball is in C:\ProgramData\BMW\ISPI\data\TRIC\ICOMNext after you installed the MSI installer. ICOM NEXT firmware 3.14.10 is tested on forum. I test it this morning on a CIC of an E90 and an E60. And now also ICOM NEXT is flashing like HELL. So the bug of slow flashing CICR is gone with this upgrade. This I can confirm. THANK, it was long waiting but it was worth it. Launch M-diag Lite, Launch Easydiag, Golo Easydiag+, Which is the Best? Launch M-Diag Lite is the 2017 newest and most powerful Launch X431 OBD2 code reader among Easydiag 2.0 and Golo Easydiag+. Launch M-Diag Lite not only excels in basic obdii diagnosis but special functions like bi-directional capability. Launch easydiag 2.0 only works for four systems diagnosis. 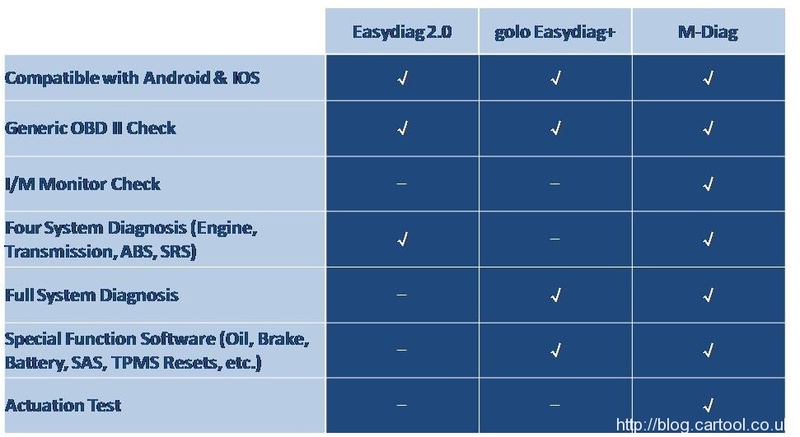 Golo easydiag+ works for full system diagnosis. Launch M-diag Lite code scanner not only covers X431 easydiag 2.0 and Golo easydiag+ (four+full systems diagnosis); but adds new special functions like Oil / Service reset, ABS bleeding, IMMO & key programming, throttle body adaptation, brake pads, steering angle reset, battery matching, DPF regeneration, Injector coding. You can choose the one you like most.But it’s wise to get the more powerful M-diag Lite with the same cost. How to use XTUNER E3 OBDII Diagnostic Tool active test on Hyundai ELANTRA HDC 2012? (ps how to install xtuner e3 on win7 64bit/win10 pad ? Chinese New Year Prestock Sale Limit Stock Hurry! Best Wishes and A Happy Healthy Prosperous 2017! For upcoming Chinese New Year Holiday 21st Jan – 3th Feb., we have prepared enough stock for most OBD Tools in our warehouse. If you plan to make new orders on our website, you’d better place the order in advance right now to ensure your goods will be shipped out timely before our holiday. What’s more, we are holding on 2017 New Year Promotion online now. Chinese New Year Prestock Sale, Limit Stock, Hurry Up! Any request, feel free to contact with us online. 1. Improve the display of “Online Store”. 2. Improve the display of “Feedback”. Extensive vehicle coverage for more than 78 brands worldwide including American, European, Asian, Australian and Chinese vehicle makes. Powerful multiple functions like real time data, ECU programming and so much more. Unparalleled OBDII supporting capability for all 5 OBDII protocols and 10 testing modes.